The use of architectural metals is a timeless design concept that can enhance the unique beauty of every home. Driveway gates, fences, handrails, fireplace doors, copper exhaust hoods, sinks and accent pieces like mirrors, light fixtures and furniture are all elements that are likely found in your home. You expend huge amounts of time and effort trying to find manufacturers of these elements that have a similar design and finish. 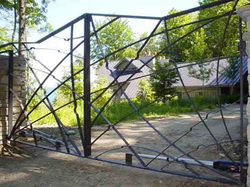 North Shore Iron Works can design, engineer and manufacture all of these elements for you. Imagine your interior handrail design coinciding with the look and finish of your dining table and chairs. Or, imagine carrying the design of your driveway gates over to your fireplace doors. We will provide you with a fully rendered 3D image of what the finished product will look like before we begin fabrication, so that if design changes are required, they can be made without wasting materials or labor. This extra step will also provide you with the confidence of knowing what the final product will look like. Our finishes transcend standard powder coating or painting. We use a combination of highly specialized patinas, dyes, waxes and protective clear coats to give the finished piece a look that is stunning and unique to your particular taste and architecture. Darin Fetter was first intrigued by ironwork when he was a child on his grandfather’s farm. Watching as tools and machines were being repaired using various welding processes was mesmerizing to him. He was fascinated by the different types of welding equipment and intrigued with the properties of iron and steel. He also discovered he had an affinity and an inherent understanding of the various methods needed for this craft. When he was 10 years old he started working at his father’s business, which entailed repairing and restoring antique light fixtures and building period replicas. This introduction to non-ferrous metals like brass and copper was a very important time of learning for him. In high school Darin attended a vocational school for welding and in college he was educated in metallurgy and engineering. Darin has since used his acquired skills in various applications, which include everything from precision welding in a prototype lab to erecting high-rise buildings to repairing oceangoing vessels and Darin has even welded underwater while he was working as a commercial diver in the Gulf of Mexico. In 2001 Darin started North Shore Iron Works with the intention of designing and manufacturing decorative functional metal work for commercial and residential markets. It is his education in the practicalities of engineering, the science of metallurgy and the vagaries of artistic bias that aids him in creating functional works of art such as railings, driveway gates, and fireplace doors, as well as one-of-a-kind furniture.